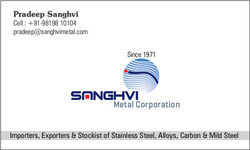 Established in the year 1971, we, “Sanghvi Metal Corporation”, are an eminent organization engaged in manufacturing, exporting, wholesaling and trading the best-in-class range of Metal Products. Developed using premium quality required basic material and latest machines, all our products conform to the defined quality parameters of the industry. To cater to the divergent demands of the clients, we offer our products in different specifications and sizes. Along with this, we offer tailor made solutions as per the client’s detailed requirements. The entire production process of the offered products is being executed under the supervision of our production personnel. This team comprises qualified procuring agents, R&D and quality controllers. All our team members are well-versed with their respective which enables them to accomplish entire production process in effective manner. They work in sync with each other in order to develop innovative products that can address emerging market demands. Along with this, we have a well-developed infrastructure setup at Mumbai (Maharashtra, India). Our setup is segmented in variegated divisions such as manufacturing, quality testing, warehouse and administration office. The production unit is fitted with world class production technologies and machines that facilitate utmost precision during manufacturing process. Thereby, make us to accomplish undertaken projects with in promised time frame. In order to satisfy our clients with the delivery, we have made our location connected with all the major transportation modes of the city. Apart from aforesaid, we ensure to exhilarate customers with our holistic business practices. We uphold ethically programmed policies during dealing process so as to ensure transparency. Along with this, our dedicated efforts towards business, we have been able to sustain trust and confidence of significant clients situated across the markets of India, Middle East, Gulf and Arab countries. With the support of our mentor, "Mr. Dharmendra Sanghvi", we have been able to actualize predetermined goals of the organization. His phenomenal managerial acumen and rich domain experience are the prominent factors that motivate us to explore new avenues in this particular discipline. We are engaged in manufacturing, exporting, wholesaling and trading the best-in-class range of Metal Products. The entire range is developed by making use of high premium grade basic material such as stainless steel, alloy, iron and others, procured from the established vendors of the industry. Developed through effective technology, this range conforms to the defined parameters of the industry. Keeping in mind diversified demands of the clients, we offer our range in different sizes and specifications. Bolstered by a team of qualified and efficient professionals, we have been able to bring forth a wide range of Metal Products having incomparable quality standards. Our team members hold expertise in executing processes of designing, developing and quality testing of the offered range in an effective manner. They also endeavor to keep themselves well-versed with emerging demands of the clients through conducting market surveys and develop products accordingly. Moreover, all our team members are dedicated towards innovation and make efforts in order to develop unique & more efficient products, which in result enable us to set trends in the market. We are a prominent organization engaged in offering the best-in-class range of Metal Products. Manufactured using high-grade basic material and effective technology, this range conforms to the defined parameters of the industry. Long lasting life, resistance against corrosion, smooth-finish and high ductility are the prominent attributes owing to which our range is widely appreciated. Certificate of incorporation is a legal document relating to the formation of a company or corporation. We have established cordial business relationships with renowned names of the industry. It due to their support, we have been able to bring forth our clients with impeccable range of products. All our vendors are well-versed with the defined parameters of the industry and develop products accordingly. Along with this, they are make constant efforts in order to design and develop improved products as to address emerging demands of the clients. In order to stand tall on the expectations of our patrons, we are engaged in offering a quality-approved range of Metal Products. The metal products offered by us are manufactured using superior-grade raw material like mild, carbon, alloy and stainless steel, which are obtained from the accredited vendors of the industry. Adhering to the international quality standards, these metal products are available in different specifications as per the requirements of our clients.